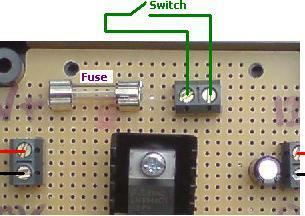 Buy of 12 VOLT REGULATOR WITH FUSE AND SWITCH TERMINALS. This version of the REUK 1 Amp 12 Volt Regulator is supplied with a fuseholder fitted to the circuit board, a 1 Amp fuse fitted, and a further two 1 Amp fuses so that you have spares to hand when/if you need them. It also has screw-in terminals which you can use to connect a switch up to the regulator. 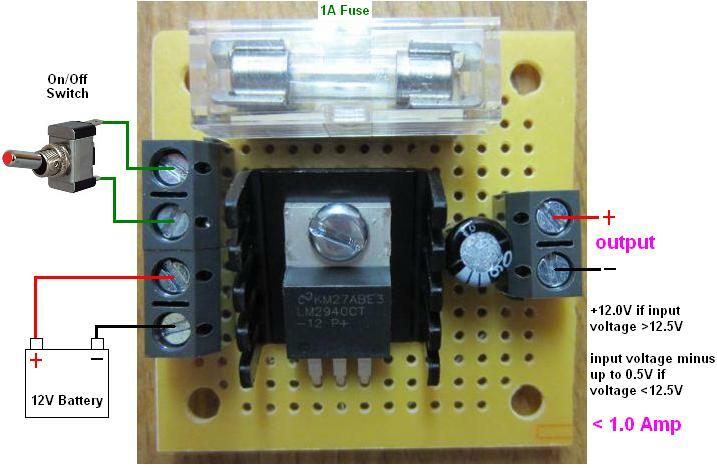 Since the regulator draws a current of around 20mA (= 0.020 Amps) even when it is not powering anything, the incorporation of the switch enables you to manually cut the power to the regulator so that stored battery power is not wasted when not needed. We also now sell a miniaturised version of the this regulator which is just 45mm x 45mm x 20mm in size. It is priced at £6.99. Click here now to find out more and/or to purchase this MINI 12V Regulator with Fuse and Switch Terminals from the REUK Shop.